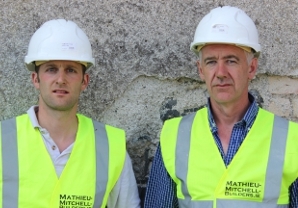 Mathieu & Mitchell Ltd is a construction and heritage conservation company based in Loughrea, Co. Galway dedicated to the conservation, restoration and renovation of historic buildings and to building smart, practical, lifetime-adaptable and universally accessible homes. Formed in 2009 by Tom Mitchell and Laurik Mathieu, the company brings together the skills and expertise associated with general construction management and heritage conservation and restoration. All staff are highly trained craftspeople possessing skill-sets and rich experience that enables the company to successfully take on and complete a wide range of projects working with traditional buildings and / or new developments. The Company's passion is to create sophisticated living spaces that incorporate the latest technologies as well as traditional methods. We work closely with our clients to assess their needs and wishes now and for the future; whether it be for a brand new home, renovation and conservation of a listed property or historic monument, construction of a commercial property or modifying a home to accommodate clients' mobility issues. Mathieu & Mitchell Ltd. operates with utmost integrity and professionalism in accordance with the highest standards in all relationships with employees, customers, suppliers, environment and the community. We foster a climate which encourages innovation and diligence amongst employees and rewards accordingly. As a company we recognise the importance of credibility, honesty and integrity to our success and believe that the relationship we have with our client goes beyond the project in hand to include complete customer satisfaction and a guarantee of our work. 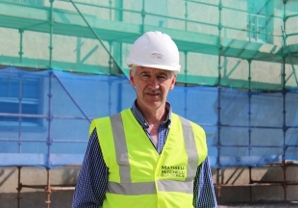 Mathieu & Mitchell Ltd seeks to promote the survival and success of master craftsmen and is currently in the process of setting up ‘Mathieu & Mitchell Academy for Conservation and Sustainable Building’. Its aim is to foster learning among apprentices and students by providing an opportunity for new apprentices to be trained locally in various skills and crafts relating to building construction and conservation while addressing a shortage of skills in the manual trades. Tom has been a self-employed Building and Masonry Contractor since 1994 constructing various commercial and private builds such as hotels, entertainment complex, corporate parks, housing estate and private dwellings. 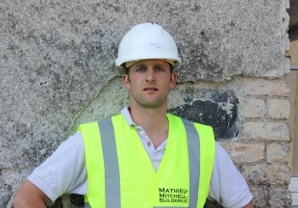 In 2009 he set up Mathieu & Mitchell Ltd with Laurik Mathieu, bringing together an extensive range of skills and expertise in general construction and in specialised heritage restoration and conservation. Acting as Foreman/Bricklayer with Navillus Construction, New York, USA which specialised in-high end commercial masonry and stone Tom worked on projects such as New York City Hospital, World Wide Plaza, City Spire, East River Savings Bank and various private builds. As a self employed Building Contractor and Masonry Contractor in Ireland constructing various commercial and private builds such as hotels, entertainment complex, apartment complex, corporate parks, construction of 4x houses in Sligo designed by Gislain Luthers and Associates Architects and a housing estate consisting of 86 luxury homes and numerous private dwelling houses. Other works involved external wall insulation and stonework, and conservation / restoration of heritage listed buildings. Laurik is a qualified Builder and Stonemason with expertise in the restoration of historic buildings. He originally trained as an apprentice with the Association des Campagnons du Devoir in France for 8 years gaining extensive experience of various crafts, working with historic materials and utilising traditional construction methods. As a master craftsman and historic monument specialist, Laurik has worked on a number of conservation projects based in France such as the restoration of dry stone walls at Chateau de Margina sur valouse, the complete external restoration of the Church of Riotor, stucco at the Museum of the Pila and work on the Cathedral of St Chamont. He also carved and fitted a rosacea on the gable of St Gingolph Church and was part of the on-going restoration of St Paul en Cornillion castle. In Ireland works have included new builds and restoration/conversion of public and private historic buildings employing skills such as lime washing, decorative plastering with lime (clay plastering, hemp), high quality masonry, paving and building insulation. Laurik also provided training to apprentices and companies over 3 years in geometrical drawing, stonemasonry, bricklaying, use of lime, decorative plastering and the use of hemp in building. Maurozan has worked in the construction industry in Brazil for 15 years working mostly in the wet trades. (concrete, plastering, tiling, brickwork, paving) and more recently has completed 5 years in-house apprenticeship at Mathieu & Mitchell under Laruik Mathieu gaining stonemasonry and lime plastering skills. Maurozam has applied his skills on conservational projects such as Roxborough Gates and Irish Workhouse Centre. References for completed Works Projects and evidence of Staff qualifications can be provided upon request. The following list of contractors are highly trusted and respected for their specialist quality work and are available to Mathieu & Mitchell Ltd when required to supplement existing personnel and skills in fulfilling works contracts accepted by our company.